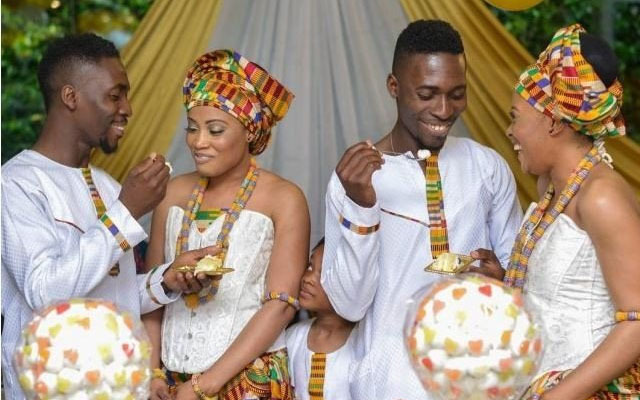 A happy day for the two sets of identical twins from Ghana, twin brothers married another twin sisters on the same day. Both couples wore authentic traditional outfits. Happy brothers pose for the camera is proud of finding such beautiful and rare brides. They say twins are inseparable in life and death, but these brothers and sisters have decided to be inseparable even in marriage.Very interesting, Living a dream most people would wish for. Together the men and women look perfect. Hope their married life would be as smooth as their wedding was, and as happy. Certainly, their wedding and marriages are unique. There are high chances both couples would have twin kids, too. We wish them all the best. They bring enjoyment to all of us by their gorgeous looks. The brides are so beautiful, and the men are so lucky! May the Lord bless these people, their families, and their future kids! Enjoy these photos and share away with your friends.